Indian Prime Minister Narendra Modi noted Tuesday Russian President Vladimir Putin’s efforts in convening the first summit on conservation of tigers in 2010. NEW DELHI (Sputnik) – In 2010, Russia’s St. Petersburg hosted the International Tiger Conservation Forum, with donors reportedly pledging some $330 million. "By protecting the tiger, we protect entire ecosystem and ecological services, which are equally crucial for the well-being of human beings. 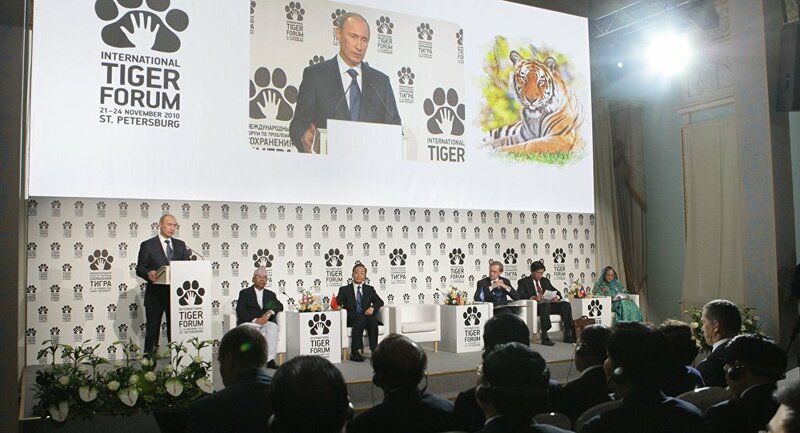 I must mention the great effort made by Mr. Vladimir Putin in convening the tiger summit in 2010," Modi said at the third Asia Ministerial Conference on the tiger conservation. The minister stressed that forests were inseparable from animals. "Conservation of tiger will ensure a good future for us and our coming generations," Modi added. New Delhi is holding the summit on April 12-14. Representatives of Nepal, Bangladesh, Bhutan, India, Vietnam, Indonesia, Cambodia, Laos, Malaysia, China, Myanmar, Thailand and Russia are taking part in the event. Cambodia’s Tigers Declared Extinct, But Can They Still Come Roaring Back?